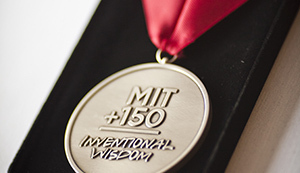 The centerpiece of the MIT150 celebration was a formal academic event held on April 10, 2011 to recall the 1949 Mid-Century Convocation and to celebrate the scholarly accomplishments of MIT faculty and students. 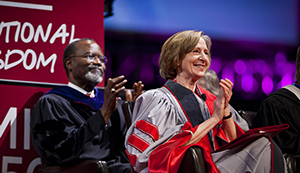 The theme of the Next Century Convocation was the “habits of mind” fostered by MIT research and education: integrity, diligence, service, social responsibility, and creativity. 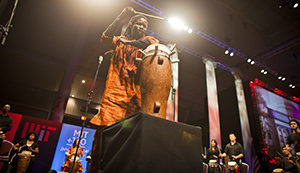 The musical program was composed, conducted, and performed by MIT's own musicians. 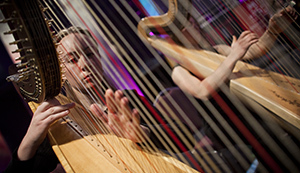 Charles Shadle set to music the poem “The Geniuses Among Us”, by Marilyn L. Taylor, poet laureate of Wisconsin (2009-2010). 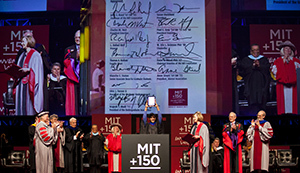 All were invited to the convocation, held on April 10 at the Boston Convention and Exhibition Center (BCEC). Convocation guests enjoyed an exhibit produced by MIT Lincoln Laboratory to showcase its primary mission areas and advanced technologies. The Alumni Association hospitality suite offered an MIT150 slide show and videos, photos with our mascot, Tim the Beaver, and information about programs sponsored by MIT and the Alumni Association. Before the program, guests participated in an interactive trivia game designed by MIT students.